Tuesday night started as a challenge for the Turkey Valley boys’ basketball team (2-1, 2-1 UIC) that turned into a convincing 64-47 win over Central Elkader (1-2, 1-2 UIC). The Trojans and Warriors kicked off the game in back-and-forth fashion as Central moved the ball within the TV zone with ease, forcing the Trojans to switch defensive strategy. After the first eight minutes, TV held a slim advantage, 12-9. Both squads repeatedly found their targets in the second quarter posting halftime scores of 30-25, in favor of the Trojans. 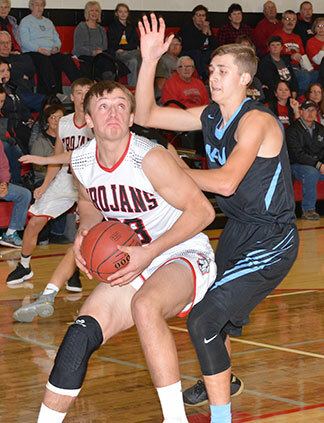 Halftime adjustments proved critical to TV’s success as Central was held to one basket and free throws in the third period and the Trojans went on to win, 64-47. Ethan Leibold had a huge night for TV with 33 points, 15 rebounds and five assists. Kalvin Langreck provided a spark off the pine with 12 points. Defensively Eli Nymeyer and Kannon Leuenberger came away with two steals each. Leuenberger also had a pair of blocked shots. Turkey Valley will host MFL MarMac Friday, Dec. 7, at 7:30 p.m. Saturday, Dec. 8, they are at New Hampton at 7:30 p.m. Next week kicks off at Kee High Tuesday, Dec. 11, at 7:30 p.m.